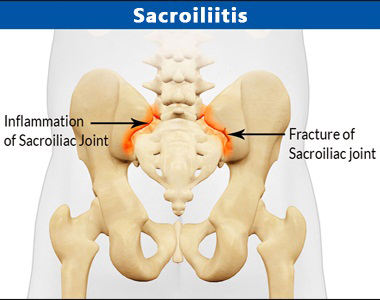 The term Bilateral sacroilitis is defined as the inflammatory disorder right in the sacroiliac joint. This joint is situated on both the sides of the lower spine, which is formed with sacrum bone in the centre and hip bones on both sides. It helps in connecting the lower spine to the iliac bone of the hip. It is the disorder related to the spinal column. This disorder comes under the category of spondyloarthropathy. And, it includes the various conditions like psoriatic arthritis, reactive arthritis, ankylosing spondylitis and many others. It may also be considered to be a part of various categories of arthritis like osteoarthritis, Crohn's disease and Ulcerative Colitis. This term is also often used with the term, sacroiliac joint dysfunction. It is the swelling in one or both the sacroiliac joints, which are present right where the pelvis connects to the lower spine. This disorder results in huge pain in the buttocks and lower region of the back. Often, it may travel down to the legs as well. Standing for prolonged duration or climbing stairs may aggravate the situation and worsen the pain to a significant extent. It often becomes difficult to be diagnosed. This is because, it is often mistaken to be linked to some inflammatory spinal arthritis, which may be a reason for severe back pain. Sacroilitis joint dysfunction may or may not always be linked to arthritis. There may be several other causes of this inflammatory disorder. Traumatic injury or Trauma: The ligaments which are surrounding and supporting the sacrum may be injured due to trauma. This trauma may be severe many a time. For example, a sudden fall or accident of the motor vehicle can lead to sudden impact damaging the sacroiliac joints significantly. Arthritis: Osteoarthritis, which is also known as the wear-and-tear type of arthritis may occur in the sacrum or sacroiliac joints. It is a type of arthritis, which affects the spines of the individuals. Pregnancy: During pregnancy, the scaroiliac joints have to stretch and loosen as well while giving birth to the child. Also, the gain in weight during pregnancy may often cause more stress or pressure on the joints. There is relaxation of the ligaments and muscles of the pelvis. The ligaments become extremely lax and the joint may slip away from the place. This may be extremely painful. And, these may give rise to abnormal wear and tear to a huge extent. However, symptoms move away after pregnancy and the ligaments can become stronger as well. Infection: In rare conditions, these joints may also catch infection. Thus, this infection may lead to bilateral sacroilitis considerably. Stress: Certain conditions like surgical spinal fusion or severe arthritis may lead to severe stiffness in the spines. The stiffness may lead to more mechanical stress at the joint. This, leads to pain and some other degenerative changes in the spine to a huge extent. This inflammatory disorder may occur in the lower back region and buttocks as well. The pain also affects the groin, legs and the feet as well. This pain often becomes aggravated due to standing for prolonged period of time, carrying more amount of weight on a leg, when compared to the other leg, climbing stairs, taking long strides and running as well. Psoriasis, inflamed eyes and acute fever are some important symptoms of the disorder. This inflammatory condition may lead to severe insomnia and depression to a huge extent. Ayurveda, the science of healing takes care of various disorders in its own sense. This medical science states that the joint disorders or any related complications are caused due to the accumulation of harmful toxic substances in the joints of the body of the human beings. These toxins are also known as "ama" in Ayurvedic terms. Thus, the Ayurvedic treatment aims at the reduction of the ama from the parts of the body. There are several effective herbal medicines available for the treatment of this inflammatory painful disorder. The holistic system of medicine makes use of the various Ayurvedic medicines to provide relief from this painful complication. This herbal treatment method uses some wonderful herbs to fight away the inflammation, pain and other complications of this painful disorder. The various medicinal properties of the herbs make it absolutely effective to provide relief from the symptoms of the disorder and the entire disorder as well. 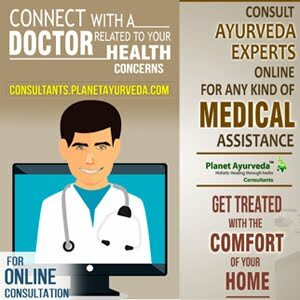 Planet Ayurveda, the global manufacturer of herbal supplements help to provide relief from the symptoms of the painful disorder to a huge extent. 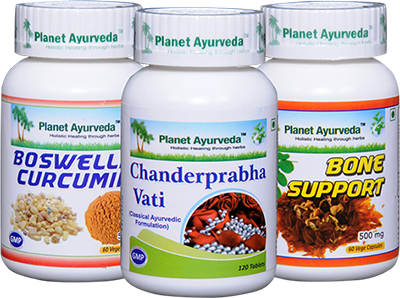 These herbal supplements manufactured by Planet Ayurveda are vegetarian in nature. These are completely natural and have no chemicals or preservatives added to them. Here is a list of the Ayurvedic medicines, which help to fight away this painful disorder to a huge extent. This herbal supplement is extremely effective in fighting away the pain and swelling of the Bilateral sacroilitis. Also, this medicine helps to treat the disorder right from the roots. This tablet helps in maintaining the overall health of the individuals. These medicines help in maintaining healthy bones and healthy skeletal systems of the human body. These capsules are extremely effective for fighting away the main symptom of inflammation of,Bilateral sacroilitis. These capsules help in maintaining the health of the joints and bones considerably. This also helps in maintaining the overall health of the individuals as well. Thus, these herbal supplements play a vital role in eliminating the pain and inflammation of the joints to a huge extent. Also, these help in maintaining the health of the bones, joints, muscles and the entire skeletal system of the human beings.